Let dough thaw according to package directions and unroll both crusts. Cut 4 circles in each crust and gently press into muffin tins sprayed with cooking spray. Cook at 450°F for 8 minutes, or until golden. Let cool 1 hour. To prepare the filling, mix all remaining ingredients besides the zest in the blender until still thick. Pour into cooled pie shells. Let freeze for 3 hours up to overnight. Pull out of freezer for 30 minutes before serving and garnish with orange zest. Nothing makes a weekend breakfast more exciting than shaking it up with some Mimosas in Champagne flutes. The orangey-Champagne flavor is so bubbly and delicious. Mmm…I think I’ll go make one right now. 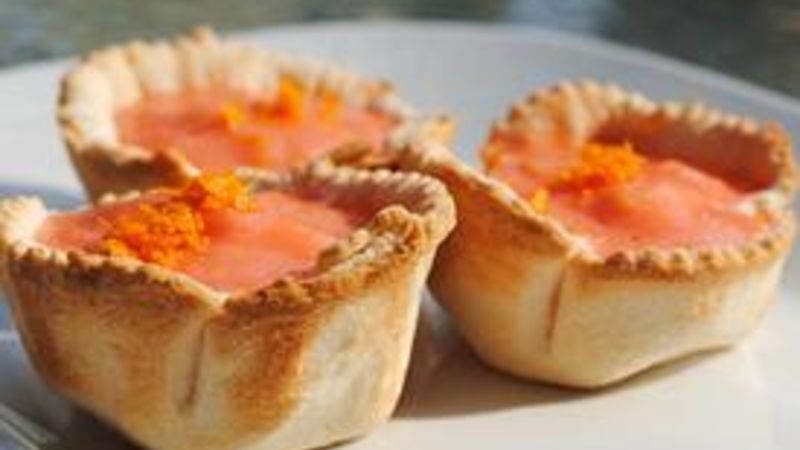 When I saw this recipe for Strawberry Dacquiri Cocktail Pies, I knew I wanted to make them into Blood Orange Mimosa Pies. And that’s exactly what I did! Using Pillsbury’s Refrigerated Pie Crust (because honestly, who has the time to make pie crust? ), I created these mini Mimosa Pies that are perfect for a dessert or brunch with friends on a spring day! Technically they are Blood Orange Mimosa Pies because of the sorbet flavor I used, which is why they have a nice orangey-pink color. Let the pie crust defrost according to package directions and unroll it on a cutting board. Using a pastry cutter, cut out a circular shape in the dough—there is no exact measurement for this! Press a circle into a muffin cup and repeat with the remaining circles. Here’s a tip: Use every other muffin cup so the crusts don’t touch each other while baking. Bake the crusts for a little less than the package says so they don’t burn and let cool for about an hour. For the filling, you’ll need to get your blender out. It’s similar to making a smoothie. You’ll add Yoplait yogurt, frozen orange pieces, sorbet and Champagne and blend just a little bit. You want it to be fairly thick. No one wants to bite into a soupy pie! The Champagne gives the filling a bubbly, effervescent flavor that is fresh and makes you want to conquer the world after just a few bites. Or at least that’s what it did to me! Next step is to scoop the filling into the cups and freeze these puppies for about three hours. I let mine freeze overnight. You’ll need to let them thaw a bit before you serve them, because once frozen you definitely cannot experience their fruity goodness—about a half hour sitting out will do the trick. For some extra garnish, zest an orange, being careful not to include the bitter white part of the peel. Pair your cool treats with a Mimosa beverage for some extra vitamin C (and because you’ll have to use up the leftover Champagne anyway!). Serve these chilly treats on a hot day to be the most popular person at the party—I promise!